First CD of this French band that has recently opened for Magma at Bourg les Valence. A superb recording, heavily influenced by Magma (sound, compositions & spirit). Very much recommended to all Zeuhl fans!! 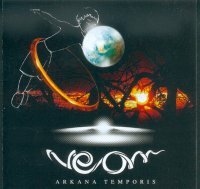 Neom is a new entry into the legions of French “zeuhl influenced” bands, although that doesn’t become totally apparent until about three minutes into the first track when the Fender Rhodes kicks in and starts a nice repetitive groove with the bass and drums. The choral arrangements follow, some French lyrics though understated, mainly just cool vocal effects that enhance the steady drive and the groove. Their music regularly cycles through more aggressive sections and quieter introspective phases, growing and evolving as it goes, building on its own strength. What’s really different here is the very prominent role for electric guitar, very out-front recalling bands like Eider Stellaire and Eskaton in their prime, which is played by drummer, composer, vocalist and presumptive bandleader Yannick Duchene Sauvage. It’s this overtly aggressive guitar, almost psychedelic at times, that keep this writer coming back for more listens. Other musicians are credited with the electric piano, bass, and ‘introduction drums’ (whatever that means), and there are additional uncredited female vocals. There are really only two tracks here, the lengthy four-part “Act I” clocking in at a mere 43 minutes, and the 12 minute “Act II” that follows it. This is a promising band presenting an excellent production their first time out, and I certainly look forward to what they follow this up with. Fans of the zeuhl sound will definitely want to check this out.